Here is yet again a photo of my cat Shyna. 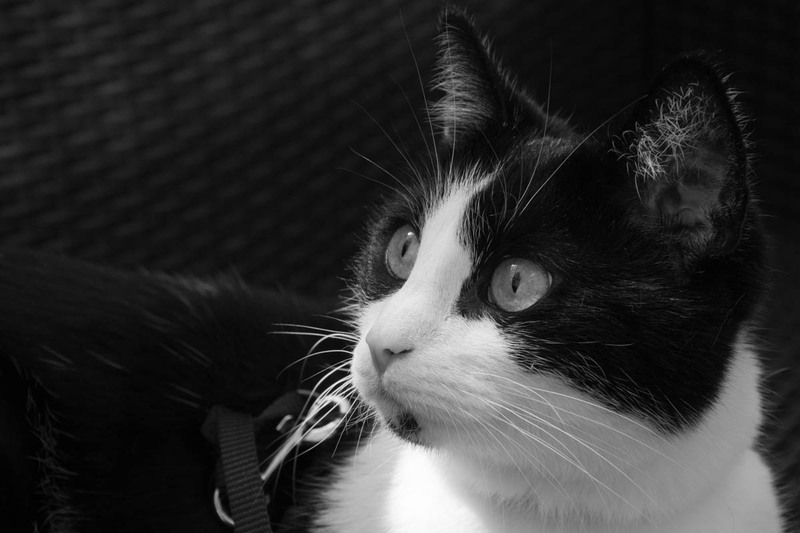 The photo was taken when I still was in Reinfeld, we shot the photo on the terrace as I had her on a leash. I edited the photo with Lightroom, I wanted to crop it a bit, I made changed to the tone curve and converted the image to black and white as I was not happy with the overblown highlights. My cat is always photogenic, it’s no rocket science to take pictures of her, because she will like all cats just look good. I’ve been meaning to ask — Does Shyna mean “pretty”? Because Shayna means pretty in Yiddish and sometimes the languages are close. Just wondering. I had this episode where I was totally fascinated by the Chinese culture. I had pen pals in China, I started to cook Chinese food, I collected Asian sculptures at that time like Buddha figures or Chinese dragons, laterns and my whole apartment looked a bit oriental. A girlfriend got me into this, and then I got the cat and was not very creative but inspired and called her “China”. Then it happened almost every time after someone asked for the name of the cat, jokes or serious questions like “Are you communist or what?”… her name was absolutely not meant as political statement, nor had my living taste at that time anything to do with it. I was annoyed when the first people started to make other jokes about her name and Chinese people eating cats… Something had to happen and I became creative 🙂 My cat was sometimes quite shy, she still is unless she knows you…. I used the word “Shy” and used “na” as extender. On the vet paper she is now called Shyna, but it sounds the same like the English word “China”, her previous name… for her nothing changed. I like it that the Yiddish “Pretty” looks the same, althought I didn’t know that… the word is cool and would be true too 🙂 In German “pretty” means “hüpsch”, “schön” and a couple of other words for it. Ah. Got it 🙂 Sounds like, but isn’t. I collect Chinese very old porcelain, so I have huge reference books in Chinese that I can’t read, but use to identify pottery marks. Chinese culture is fascinating. People are sometimes incredibly dumb, aren’t they? Exactly, sounds the same, but I could now avoid future discussions about the name due to the new meaning and it really worked (laugh). Yes, people are sometimes dumb, but when you get older, you swap your friends at some point, I never had these discussions with my new friends, they are smarter, they know the background of the cat name too. Today my living room looks a bit more modern but there is still an oriental touch as I still have some laterns and figures in the room, it still has the oriental cozy touch. My objects aren’t worth anything, I purchased the oriental stuff in a furniture shop. I believe I commented on one of your porcelain posts a while ago, I can see why you collect old objects, it’s very interesting. I can’t read Chinese either, I usually communicated in English or German with my pen pals back then, one pen pal was really good in German. I was lucky in that I grew up around art and in particular, Oriental art. My mother really loved it and we had block prints, pottery, tapestries … really nice stuff. I’ve always loved art and I’ve been collecting Asian art for many years. Now, I’m trying to re-home a lot of my stuff so when I’m gone, this beautiful (and sometimes very rare) art has a safe home. Then it has even more value to you, it’s heirloom and interesting Oriental art. I don’t know a lot about art, but the patterns and style of Oriental objects are very beautiful indeed, so that I can see why people appreciate this type of art.